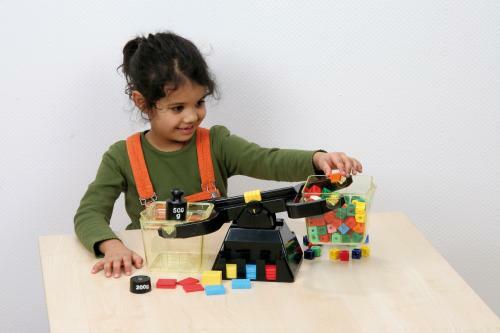 This sturdy balance is specially developed for Foundation Phase learners to teach a wide and varied experience of weighing. A great tool to compare volume vs weight. The balance contains 2 square plastic buckets with lids. Each bucket contains 1 litre. Learners can read the volume of liquids and place weights on the scales of the bucket. The lids can become pans to use with small objects or to hold the weights. In the balance 2 selections of weights are stored (1 in the front side and 1 in the back side). made between volume and weights.